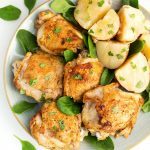 Instant Pot Chicken Thighs with Potatoes are cooked together in your Instant Pot electric pressure cooker. I show you how to make pressure cooker chicken thighs and potatoes, together. At the same time! Instant Pot Chicken Thighs with Potatoes is an easy way to cook two things at once. It’s even easier if you use food that doesn’t have to be browned first, but these taste much better if you do brown them. You could broil them after you pressure cook them, that might crisp up the skin a bit. I just want to eat when the Instant Pot is done cooking them. I know they won’t be crispy, otherwise I’d just use my oven. I say that because there was a discussion I read about browning before or after pressure cooking. Lots of differing opinions! I like doing it this way. When I make them with BBQ sauce, I don’t brown them first, I broil them after pressure cooking, to caramelize the BBQ sauce. Yum! You could definitely do the potatoes with BBQ chicken if you want. I have been getting questions about the tall legged trivet that I use. I bought a super cheap one on Amazon two years ago, and still use it. I have linked to it below the recipe card. Note: It took a long time to get it, so you may want to peruse other brands if you need it soon. Instant Pot Chicken Thighs with Potatoes are cooked at the same time in your electric pressure cooker. An easy recipe for beginners to learn to cook two things at the same time. Put the spices in a small dish and mix together well. Sprinkle on both sides of the chicken thighs. Press the Sauté button on the Instant Pot. When the display reads Hot, add the olive oil. Add 3 or 4 chicken thighs, skin side down, and brown them on both sides, about 4 minutes per side. Repeat with the remaining thighs. Set aside on a plate. When all of the thighs are browned, carefully remove any remaining oil from the pot. If the bits on the bottom of the pot are too blackened, add a little water and use a wooden spoon to scrape them off and discard. Otherwise, keep the browned bits in there for flavor (Sometimes spices get a little burned). Add the broth to the pot (still on Sauté mode). Stir and scrape any remaining brown bits on the bottom of the pot. Add the potatoes, butter, and the rosemary. Put a tall trivet over the potatoes. Set a steamer basket on top of the trivet and add the chicken thighs to it (make sure they don’t set up above the rim of the pot. You need to be able to comfortably get the lid on). Press the Poultry, or the Manual button, and use the + or - button to choose 13 minutes. When cooking cycle ends, let it naturally release pressure for 5 to 10 minutes. Don’t let it go longer than that. Manually release the remaining pressure, and when the pin in the lid drops, carefully open the lid, facing it away from you. Carefully remove the steamer basket with the chicken to a plate. At this point you can either use a potato masher to mash the potatoes right in the pot, or remove them with a slotted spoon and make gravy from the drippings. If you choose to remove them, set them aside and turn on the pot to the sauté mode to make gravy. Add a cornstarch slurry to the liquid in the pot (mix 2 Tbsp cornstarch and just enough water to make it loose, and whisk it into the hot liquid in the pot). Keep stirring until it thickens. Turn off the pot and serve the gravy over the potatoes, and the chicken thighs if you’d like. Add 1/8 tsp Cayenne Powder to the spice mixture for a little kick. Tried this tonight and it turned out perfect. So delicious!!! Thank you! Hi Barbara! I’m happy you liked this recipe! So nice to hear from you. Thanks! Making this tonight! Sounds yummy! I don’t have a steam basket…any advice? Thanks! Hi Elissa! If you don’t mind them getting wet, you can just toss them on top of the potatoes. Or, put the trivet/rack on top of the potatoes and the chicken on top of it. Thanks so much! I was wondering if I should put foil on the trivet to keep the chicken from touching the liquid. I’m so new to the instant pot haha can’t wait to try this tonight! You can, but I would poke a few holes in it so the juices can drip onto the potatoes and flavor them! Yum! This was delicious! Definitely a new ‘go to’ meal for my family! I did it with the foil on the trivet and poked holes. Thanks! I made this tonight and it was delicious 🙂 my potatoes were a little under (a few clumps) but I think I can cut them smaller next time and they would be fine. Definitely one of my quick and easy suppers for busy days. Hi France! I’m glad you liked the recipe! The size of the cut potatoes is important, and the type of potato as well. Red potatoes tend to take a little longer, so if you ever use them with this recipe, just cut them a little smaller. Thank you for your review! Can the chicken be stacked or does it have to be a single layer? I have about 4.4 lbs of chicken thights to use – family of 6…..
Hi Paula, I try not to stack it, but I sometimes do. As long as you have browned it first, the parts touching should be cooked. Or would you recommend a tall rack? And, yes, I will definitely brown it first. TIA!!! If I use the trivet, it is because I don’t want the skin to get too wet, or a spice rub washed off, usually. But I think it would be good to also use one in your case. if i wanted to make this without the potatoes, is it the same time and liquid amount? dont want the chicken to burn on the bottom. thank you! Hi Suzy, yes, it is the same cook time. Maybe use the trivet if you are concerned with the burning? Excellent flavour and very easy to make!! A new family favourite. Fabulous recipe! And the instructions were spot on. My family loved it and I have some picky eaters! I put the chicken under the broiler for about 5 min and it crisped the skin up perfectly! And I made gravy out of the stock and it was a big hit! This will be a staple in our house… Thank you! Hi Bill! That’s awesome! You must have a meat and potatoes kind of gang like I do! Thank you for taking the time to review the recipe! Looking forward to trying this soon, but I’m going to be using the 3 qt and one frozen chicken thigh (as a college student, I only need one serving haha!). Any insight on how that might change cooking time? Hi Tess! I love that you have an IP at school! I wish I had, lol! The cook time is the same. The thing that changes cook time is if the meat was thicker/larger than average, or smaller/thinner. Pressure cook times go by thickness/density. That’s why a roast cooks faster if you cut it in half or thirds, etc. I hope you like the recipe! This was amazing!! My family loved it…even the one year old “new to table food” grandson. I just got an Instapot Gem multi cooker for Xmas. Any thoughts on it? I’m having a hard time finding recipes for it. That’s so great, Vickie! Anytime you can get your home cooked meal approved by the little ones, it’s a good thing! I haven’t used the Gem yet. It is on my list though. There was a recall on some of the units, so be sure to check to make sure yours isn’t one of them! I will be developing Gem recipes in the near future. Thank you for the nice review! I made this today, and it was very good. The chicken thighs had so much flavor, and it was so easy. Will be making it again soon. I mashed the potatoes, and made the gravy. Used 4 thighs, two for me and two for a friend. Next time will use more chicken so I have leftovers! Hi Nancy! That’s great! I’m glad this recipe worked out for you. Sometimes, it’s the simple recipes that we end up liking! Thank you for taking the time to review! I’d like to make this tonight, how would you adjust the cooking time for boneless/skinless thighs and russet potatoes? Thank you! Hi Randi, I would cut the time to 8 minutes, with a 7 minute natural release, if the thighs are small. I’m making this tonight. I’m sure it will be terrific! Thanks for posting. Hi Pamela, I hope you like it! I want to try this with some boneless skinless thighs I have on hand. Should I still brown them even though they’re skinless or is browning skinless chicken a no no? I’m not only new to the insta pot but cooking in general. ? I will probably just use red potatoes so should I stay with original time or adjust for the boneless skinless thighs? Thanks! Hi Rick! Truthfully, I usually only use frozen when I use thighs. I don’t think it would hurt to season and lightly brown the ones you have, if thawed. The cook time will be less, closer to 10 minutes. 8 if the thighs are small. Red potatoes take a little longer to cook, in my experience, so maybe cut them just a bit smaller? Let me know how it works! I’d like to try frozen thighs so i can throw them in straight from the freezer when I’m ready to cook so can I season and brown from frozen or does it have to be thawed before you season and brown? I would think they would need to be thawed to be seasoned and browned properly but like I said, I’m new to this! Thanks again! Rick, it’s easier to season them when they are thawed. You can run them under cold water and pat dry, then rub a bit of oil or butter, then the spice on them. They won’t brown as well as thawed though. Myself, when I use frozen, I just toss them in right on top of the potatoes, sprinkle on the seasoning, and cook them like that! My family loved this recipe and can’t wait for me to make it again. We just bought a 6qt. Instant Pot and this recipe has caught my eye. I was even thinking of placing some raw julienne cut carrots in there as well. Don’t know how that would work out, but experimenting is the best part of learning. What I would like to know is where you found the tall leg trivet, as this is a great way to separate thighs and veggies and allow the broth and chicken to drip onto the veggies, but I can’t find one. And real quick, at this point, the lower trivet rack that came with the cooker will always stay on the bottom, yes or no? As far as the short trivet, I don’t use it for this recipe, and will let you know in each recipe if it is needed or not. Some recipes do not need a trivet at all. I was thinking that the food would burn if touching bottom without the trivet being there. We’ll look into that long legged one. As long as you deglaze the pot and have adequate liquid, it should be fine. If you haven’t already, you can watch my video, and that might help. Hi Jane! I’m so glad you decided to jump in with your IP! I hope you have fun, and cook up some tasty meals for yourself! Thank you for your story, I love it! I made this last night using 2 large chicken breasts that I cut in thirds to be about the same size as thighs. The chicken was a little more dry than if we had used thighs, but it was still delicious, and will definitely be a new staple option for my family. I had some leftovers for lunch today and I think the chicken tasted even better than it did last night! That’s great, Shaina! I would cook a few minutes less when using breast meat, and maybe only cut them in half, or try one whole and see how it comes out. Then you will know for the future, and have a great go-to recipe! Thank you for your review! I’m new to Instapot. This recipe looks easy and tasty. Once the dish is cooked how long can you leave it on warm? I need to prepare dinner early. I don’t have the long leg trivet. Will it work to place the rack that came with the Instapot directly on the potatoes and the chicken on top? Hi Kathy, You can leave it on warm for a while. The issue is that if it naturally releases longer than the recipe states (5-10 minutes), the chicken runs the risk of being overcooked. You may have to just test it out. Maybe take a few minutes off of the cook time to balance out the time. If it is not quite done enough when you get to it, it’s easy enough the set it for another minute to finish it off. Yes, you can just put the trivet you have directly on top of the potatoes, and the chicken on that. I hope it turns out good for you! Was a big hit the family loved it. So easy and quick. The potatoes had so much flavor. I will make this again! That’s great, Kathy! Simple meat and potatoes! Thank you for your review! Could I use skinless drumsticks instead of thighs? If so should they be browned? Hi Martie, I would not bother browning skinless drumsticks. I would rub them well with the spices though, and toss them in on top of the potatoes, or put them in or on a steamer rack. Made this tonight, added some cut up carrots with the potatoes. Everything turned out delicious and my family loved it. Made the gravy too which is a fave among the kids. That’s awesome, Margy! I’m happy that the whole gang liked it! Thank you for your review! I’ m going to try this and I was wondering if you could use sweet potatoes instead and if that would change the cook time?? Hi Merrill, yes, you sure can! I would cut them in half. Cook time will depend on the size. I cook a large-ish sweet potato with the skin on for 15-20 minutes or so, so cut in half should do it. If they are small, leave them whole. I’m fairly new to cooking in the instant pot. I loved your very detailed instructions. Made this tonight and it was delicious. I’m anxious to check out your other recipes. Made this last night. Super easy…not a lot of slicing and chopping other things to put in it. I used more red potatoes that came out great and the chicken was tender. My gravy came out good and poured it over the chicken and potatoes. I’ll be making more! That’s great, Bob! Thank you for your review! Hi, Sandy! We’re really excited to try out your recipe. Thanks for posting it…and the video was especially helpful!! I have a large family and want to make extras. We have an 8qt IP and would like to make 12 bone-in thighs with the skin. We’d have to stack them. The chicken is thawed/fresh. If we have to stack the thighs in the steamer basket, do we need to adjust the time? If so, how long would you cook it on the Poulty setting? Thank you!! Hi Heather, I would maybe add a couple minutes to the natural pressure release (NPR). Since you are browning them first, you don’t have to worry about raw patches from where the thighs are touching. Just the internal temp. They should come out fine with just a little extra NPR. I can’t find the trivet that came with my Instant Pot. I’ve spent the last hour emptying every drawer and cupboard to no avail. 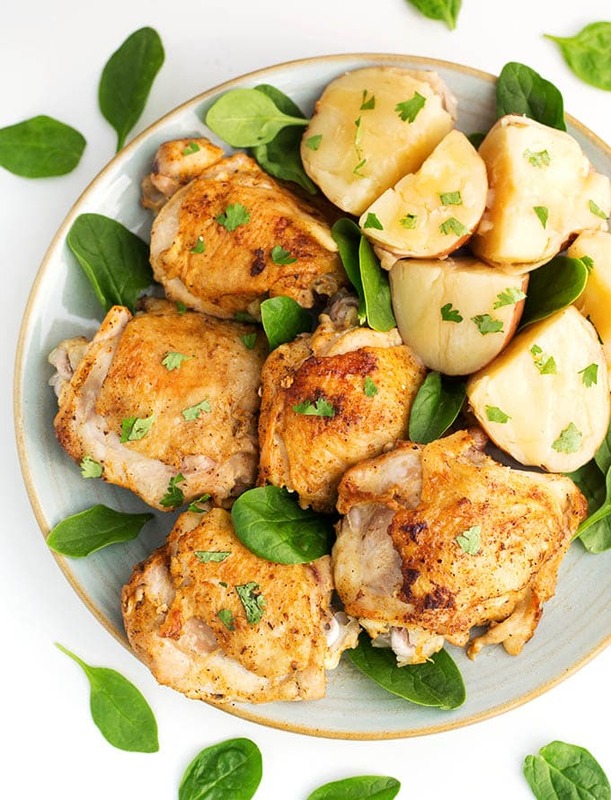 Can I make this recipe by placing the chicken directly on top of the potatoes? If not, do you have any other suggestions? Hi Hillary, yes, you can set the chicken on top of the potatoes. It may end up a little moist, but will still taste good! It has been so hot here that grilling chicken was not an option. IP & air conditioning is the way to go. And your concept to raise the chicken above the vegetables was a revelation! 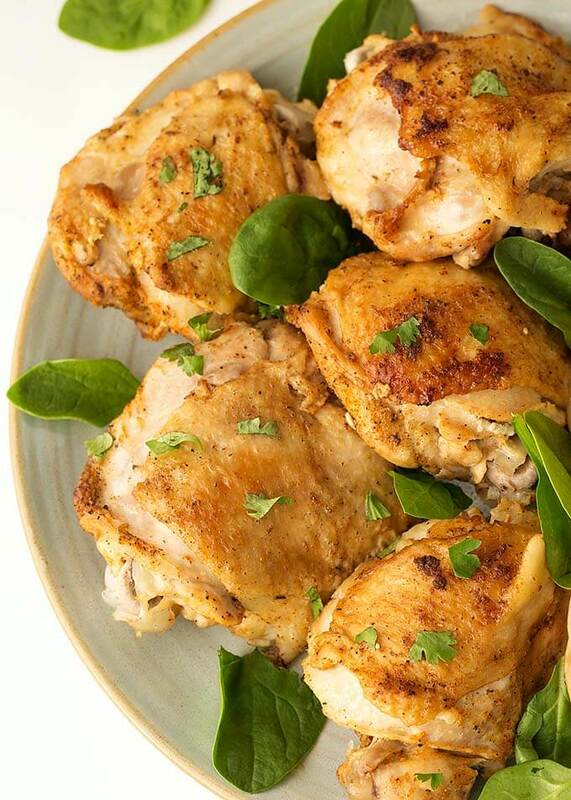 No more soggy chicken, just flavorful moist & well cooked chicken. Changed up the recipe to what I had on hand and had to improvise on the higher trivet (used the trivet that came with my pushpan, with rack on top…worked fine). Thank you for sharing this brilliant idea. Hi PattiAnn, I’m so happy that this recipe and method worked for you! It is so nice to have well cooked chicken thighs, and like you said, not soggy! Thank you for your review! Hi Scott! I’m glad this recipe worked for you! This website has a lot of Instant Pot Recipes. All you need to do is use the RECIPES link in the menu, and search by category, or use the search bar to the right of the menu to find a recipe. Happy Cooking! Can I just put the potatoes on the bottom and the chicken in top of the potatoes?? Sure! I do that sometimes. Where can I get the tall trivet. I’ve tried several places, including amazon. Hi Judy, I have that tall legged trivet linked below the recipe card. Note: It takes a long time to get it, but it’s super cheap. There are other brands to choose from. This is our new favorite quick dinner! Thank you! Absolutely delish. We will definitely make this again. I have made this a few times, and great every time! Today I added carrots and parsnips, I also cooked the onion and garlic before adding it to the pot(after browning the chicken). I am starting to actually crave it!